The Eta Aquariids are an annual meteor shower that appears to radiate from the southern constellation Aquarius. The meteor shower peaks on or around May 6 every year and is associated with Halley’s Comet, a short period comet that can be seen from Earth every 75 to 76 years. The Eta Aquariids can typically be seen from April 21 to May 20. The meteor shower does not have a sharp peak, only higher meteor rates that plateau for about a week around May 7. 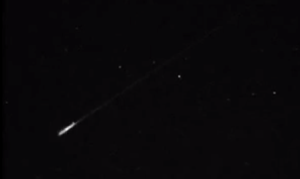 Eta Aquariid meteors are debris left behind by Halley’s Comet several hundred years ago. Whenever the Earth passes through this debris trail, little pieces of rock and ice burn up as they reach Earth’s atmosphere and leave behind trails across the sky. Halley’s Comet itself does not come close enough to Earth to directly generate meteors. 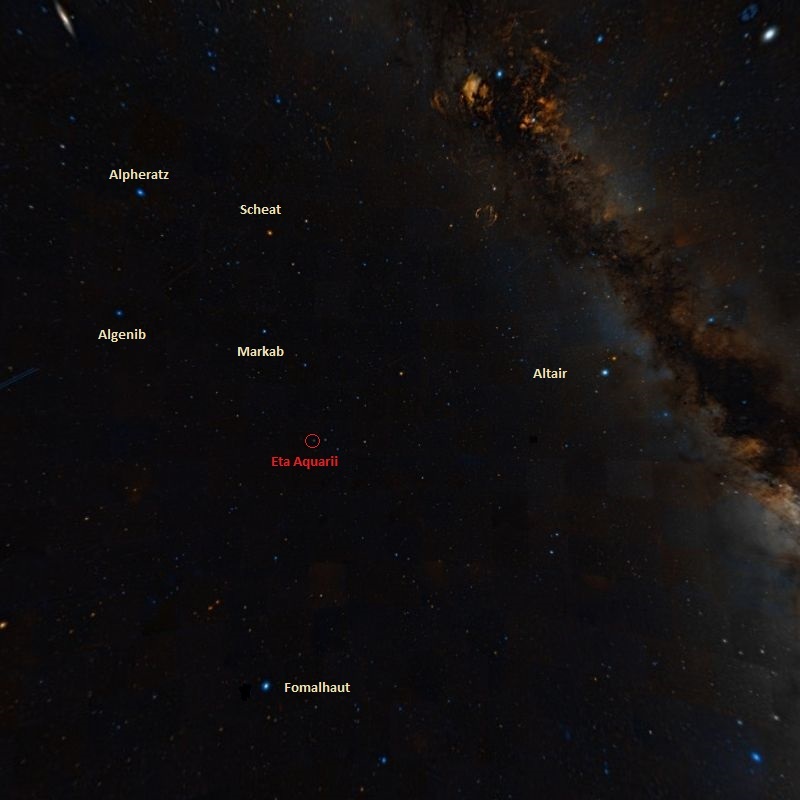 The radiant of the meteor shower, the point where the meteors appear to come from, is located near the star Eta Aquarii in Aquarius constellation. The star, however, is not physically associated with Eta Aquariid meteors because it lies 168 light years from Earth, while the meteors burn up in the Earth’s atmosphere. The radiant point and the star only happen to lie in the same line of sight. Aquarius is located in the region of the sky sometimes known as the Sea, populated by several constellations associated with water: Pisces (the Fish), Piscis Austrinus (the Southern Fish), Cetus (the Whale) and Eridanus (the River). It is not an easy constellation to identify because its stars are not very bright, but it can be found between the Great Square of Pegasus and Fomalhaut, the 18th brightest star in the sky, located in the constellation Piscis Austrinus. 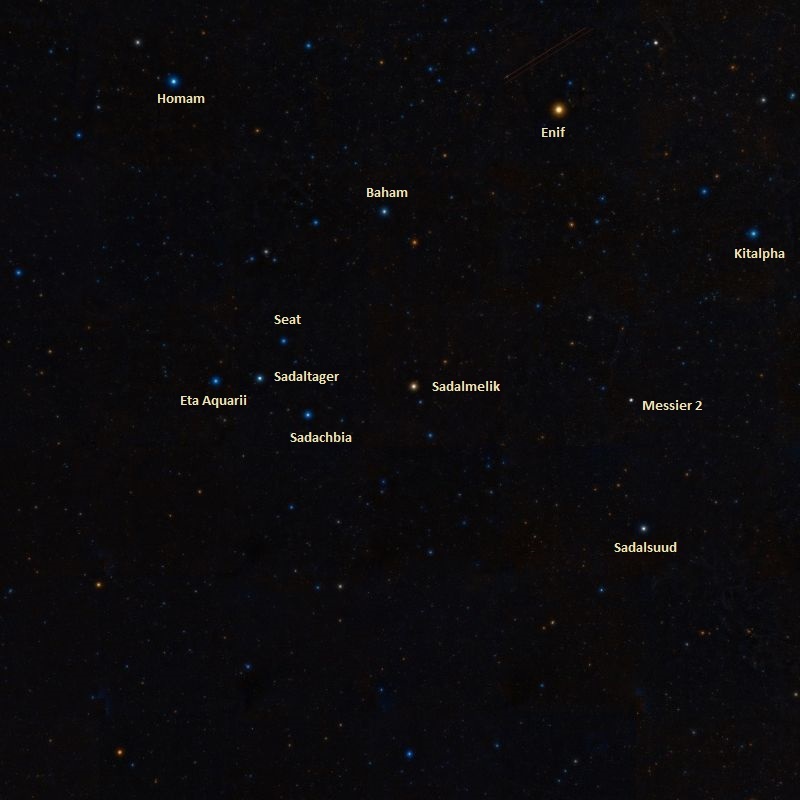 On a clear, dark night, Aquarius can be identified by the Water Jar, a Y-shaped asterism formed by the stars Zeta Aquarii (Sadaltager), Pi Aquarii (Seat), Gamma Aquarii (Sadachbia) and Eta Aquarii (Hydria). 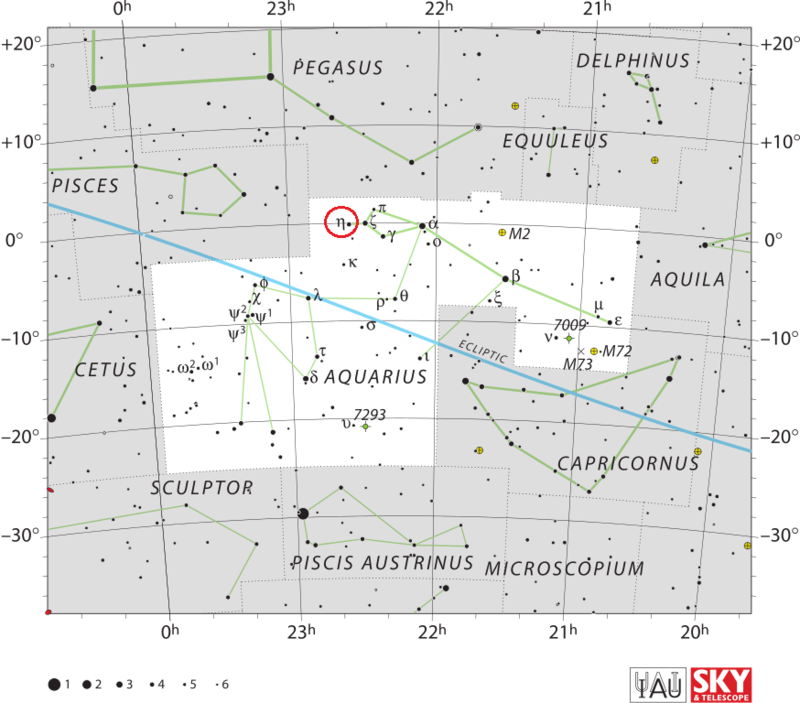 With an apparent magnitude of 4.04, Eta Aquarii is not very prominent in the sky, but it is visible to the naked eye in good conditions. The star’s traditional name, Hydria, comes from the Greek ‘υδρια, meaning “water jar.“ The Water Jar asterism represents the cup held by Aquarius, the Water Bearer. To observe the Eta Aquariids, however, it is not essential to find the radiant as the meteors can be seen anywhere in the sky. It is more important to find a dark location with a clear view of the open sky, away from any artificial lights. In 2015, the view of the meteors will be somewhat obscured by the light of the waning gibbous Moon. The peak is expected to last from the evening hours of May 5 to the early morning of May 6. The Eta Aquariid meteor shower typically peaks at a rate of about a meteor per minute, but northern observers never see that many meteors – the average rate is 10 per hour – because the radiant only appears above the horizon for a few hours before the dawn at this time of year. The best locations to observe the Eta Aquariids are those between the equator and 30 degrees south latitude. Halley’s Comet is also responsible for the Orionids, a meteor shower that occurs every October. An image of Halley’s Comet, taken on May 29, 1910 by Edward Emerson Barnard at Yerkes Observatory, in Williams Bay, Wisconsin. Published in the New York Times on July 3, 1910. The comet was last seen in the inner solar system in 1986 and will not return until 2061. Recorded sightings date all the way back to 240 BC, but the comet’s periodicity was only determined in 1705 by the English astronomer Edmond Halley, after whom the comet was named. 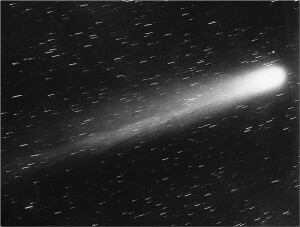 1P/Halley was the first comet to be determined as periodic. Edmond Halley used Newton’s laws to determine the gravitational effects of Jupiter and Saturn on comets’ orbits and, after comparing the data with historical records, he noted that the comets seen in 1682, 1607, and 1531 had almost identical orbital elements. This led him to conclude that they were really a single comet returning every 76 years. The Eta Aquariid meteor shower was officially discovered by Lieutenant-Colonel G. L. Tupman in 1870. Tupman was sailing the Mediterranean Sea when he saw the meteors and later examined the records of the Italian Meteoric Association to discover 45 meteors that were plotted from April 29 to May 5. His discovery was confirmed a year later, on April 29, 1871, when he plotted 8 meteors.